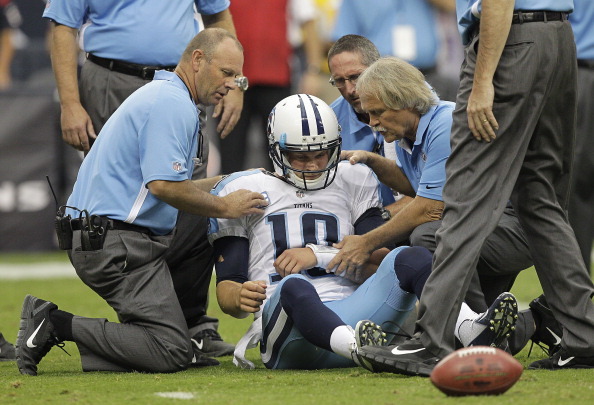 Titans starting QB Jake Locker won’t go Thursday night when the Titans play host to the 2-2 Steelers at LP Field. Locker dislocated his left shoulder for the second time this season in Week 4 against the Texans, and missed Sunday’s 30-7 loss to the Vikings. The start at QB will once again go to Matt Hasselbeck, who wasn’t very effective against the Vikings on Sunday, going 26-of-43 for 200 yards, one touchdown and one interception in the loss. Against the Texans in Week 4, Hasselbeck went 17-of-25 for 193 yards, two touchdowns and two interceptions. There’s hope that Locker will be able to play in week seven vs the Bills after the extended break after the game Thursday vs the Steelers.